Ironman Brazil has been on my bucket list for a very long time and I am pumped to finally get to complete it, especially after not being able to get down here last year due to leg injuries. It is a great course and we had just about perfect conditions for the race, making for a fun and fast competition. My day didn’t go exactly as I hoped, but I’m always happy to finish one of these healthy and I felt fine afterwards. The bonus was that I was only 2-minutes off of my personal best that was done in 2002 before I found out about my osteoporosis! To race day: I felt nice and relaxed race morning, which was nice, and Monette and I got to the race site with enough time to chill and talk for a bit before I had to get to the starting coral. The funny thing about this race was that all of the announcements were in portuguese and I had taken off my watch so I had no idea what was going on. It took me a little bit by surprise when everyone started to go! I got off to a good start, though, and felt good for the beginning of the swim. The course is in an M-shape and on the way back to shore the first time I got stuck with a group, which was okay because we were swimming pretty well. But, I get motion sick easily and when I got done with the first loop and had to run around the buoy on the beach, I felt awful and suddenly was absolutely drained. I had to swim very, very easy the rest of the way. 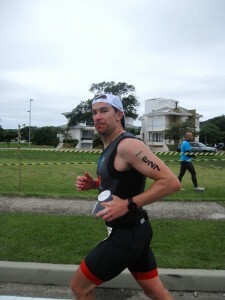 It ended up being my slowest Ironman swim, unfortunately, and about 5-minutes slower than I wanted to go. I was really disoriented in transition and even had to run back to try and get some water in an attempt to clear my head, where I accidentally grabbed pepsi instead! But, I didn’t even look at my time and was happy to be able to get on my bike. I’ve been cycling pretty well, so was excited to see what I could do. My goal was to go under 5 hours, with a stretch goal of 4:45, without tiring out my legs. It took about 20 miles, though, until the weird dead/sick feeling from the swim faded. But, once it did I felt like myself again and got into a good groove. I kept it at a comfortable pace the whole way and felt good the rest of the ride. It was exciting to see that I had gone a 4:48 and was fairly close to the front without riding that hard! The run has always been my achilles heel. I’ve only been able to run two times a week, with just one run over 16 miles and three over 13. But, I’ve been running pretty well and was hoping to pull off something good, wanting to go in the 3:30ish range. I didn’t look at my splits until afterwards, but the first about three miles I averaged right around 7-minute pace – good! However, you then hit these ridiculous hills, which was a shock to the system and fried my legs. From that point through about 10-11k I was in a dark place and wondering how I was going to get through this respectably! I’ve done enough of these, though, to know that those patches are pretty normal and you almost always get through them. I did start to feel better and got into a rhythm that pretty much lasted the rest of the way. I didn’t feel fast, but I was surprised that I ran as slow as I did because I really thought I was going faster than I was. The game plan was to keep it steady and comfortable (as comfortable as you can be in and Ironman) and I was able to do that. Monette was great, because I saw her five times on the run course through the three loops, which gave me a lot of motivation and something to look forward to. The one bright spot about my run is that my third loop was a good bit faster than my second loop! And, for not having run that much and having done no bricks except for the one race I did, I ran the whole thing (except one super steep hill) and felt good afterwards, which I am grateful for and attribute partially to wearing my Hoka shoes. The 3:51 run split wasn’t very spectacular, but I have no right to complain, and it brought me home with a 9:45 overall time. So, as always, very happy but definitely not satisfied. I’m not sure when or where my next Ironman will be yet, but the atmosphere is so amazing and it was kind of neat being down here without knowing anyone or speaking the language. We did stay with Ken Glah’s Endurance Sports Travel group, which I can’t say enough good things about, and met up with a brother of one of Monette’s co-workers as well as a good friend of our brother-in-laws, who were both awesome. The vacation in Rio was absolutely fantastic afterwards! !